And, most recently, the OECD published a report suggesting numerous schemes to increase national tax burdens. And here’s the insult on top of injury. You’re paying for this nonsense. American taxpayers finance the biggest share of the OECD’s budget. And I’m sure you’ll be happy to know that the OECD is now pushing for a massive energy tax. Here are some relevant passages from an article in the OECD Observer. 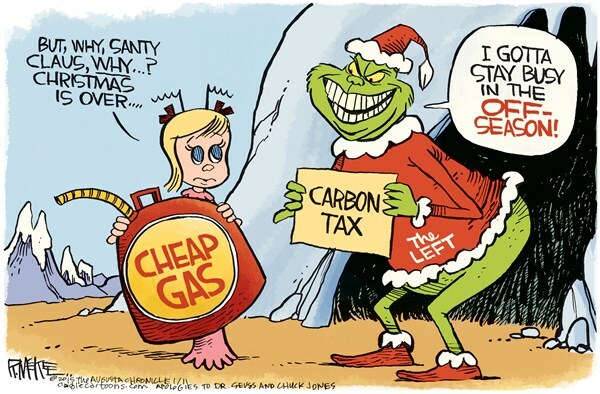 …it’s prime time to introduce a tax on carbon… “Every government will need to explain how their policy settings are consistent with a pathway to eliminate emissions from fossil fuel combustion in the second half of the century,” says OECD Secretary-General Angel Gurría. This means looking at all policy measures to assess if they are effective in reducing CO2 emissions and in line with governments’ climate change objectives. An OECD report, Climate and Carbon: Aligning Prices and Policies outlines specific actions. By the way, you can access the Climate and Carbon report by clicking here. But since I assume few if any people will want to read a turgid 57-page paper, let’s stick with excerpts from the short article in the OECD Observer. All you really need to know is that the OECD (like the IMF) wants governments to boost energy prices, both explicitly and implicitly. Explicit carbon pricing mechanisms, such as carbon taxes… other policies affect a country’s CO2 emissions and can effectively place an implicit price on carbon. …It’s time for governments to ramp up the development of alternative energies and to nail a price onto every tonne of CO2 emitted. The article also includes other recommendations that are very worrisome. It suggests other fiscal changes that would boost taxes on the energy sector. Needless to say, this means higher costs on energy consumers. …carbon pricing should also include a review of the country’s fiscal policy to ensure that budgetary transfers and tax expenditures do not, directly or indirectly, encourage the production and use of fossil fuels. By the way, when the OECD talks about “budgetary transfers” and “tax expenditures,” that’s basically bureaucrat-speak for back-door tax hikes such as changes to depreciation rules in order to force companies to overstate their income. And since we’re deciphering bureaucrat-speak, check out this passage from the article. …compensatory or other measures to mitigate the regressive impacts of reforms without losing the incentive to reduce emissions. What the OECD is basically saying is that an energy tax will be very painful for the poor. But rather than conclude that the tax is therefore undesirable, they instead are urging that the new tax be accompanied by new spending. Maybe this means higher welfare payments to offset increased energy prices. Maybe it means some sort of energy stamp program. The details aren’t important at this point, particularly since the OECD isn’t making a specific proposal. But what is important is that the OECD is using our tax dollars to advocate bigger government. So maybe the moral of the story is that we should stop subsidizing the OECD. P.S. On a related topic, and in the interest of fairness, I have to give the OECD credit for being willing to publish an article on tax competition by my Australian friend, Professor Sinclair Davidson. Sinclair points out that the OECD’s anti-tax competition campaign is based on the premise that bad things happen if labor and capital have some ability to migrate from high-tax nations to low-tax jurisdictions. Yet the OECD has never been able to put forth any evidence for this assertion. High income economies have tended to follow irresponsible fiscal policies over an extended period of time. …governments have been trying to access new sources of revenue. …The OECD has been campaigning on “harmful tax practices” since the late 1990s. …The report itself was a somewhat wordy affair that actually failed to define what ‘harmful tax practices’ constitute. …Most damning of all, however, is that the OECD was unable to produce any actual evidence of these dire consequences, arguing instead: “A regime can be harmful even where it is difficult to quantify the adverse economic impact it poses”. The dog had eaten their homework. What’s really going on, as Sinclair explains, is that politicians want a tax cartel to enable bigger government. It turns out that governments and politicians, like business, don’t always appreciate having to work at improving themselves and offering a more attractive mix of services and taxation in order to attract business. …It is perfectly understandable why governments would want to establish a tax cartel. …countries, rather than respond to such competition by competing themselves, have chosen instead to engage in fiscal imperialism – bullying and cajoling sovereign nations to change their domestic policies. Again, kudos to the OECD for allowing a contrary viewpoint. I guess the bureaucrats are more relaxed now than they were back in 2001, when the OECD threatened to cancel an entire conference simply because I was present, or in 2008, when the OECD threatened to have me thrown in jail for giving advice to low-tax jurisdictions at another conference. P.P.S. For additional information on why American taxpayers shouldn’t be subsidizing a left-wing bureaucracy in France, here’s my video on the OECD. Now you can understand why eliminating handouts for the OECD should be a gimme for congressional Republicans. None of this surprises me anymore. It is all based on the operative model of: “To the lowest common denominator”. – This is their “733t sp3ak” (“leet-speak”) for “equalization”. This is also where “social-promotion” came to be in our public “fool” (school) system. Undeniable truth: Taxes are stealing. Taking one’s hard earned property and giving to another less deserving is unAmerican. UnChristian. And unfair. The job of the OECD is to attempt to make welfare states look less bad, by making sure that as few nations as possible escape the high tax, lower motivation, way subpar growth spiral. America’s anemic growth may be severely sub-par compared to world average, but it’s still much above growth levels seen in European welfare states. This American growth is giving Europe a black eye, and thus it must be destroyed according to the European majority comprising the OECD management committees. These days they have actually found someone in the White House that will help them do that. It may just be the right time to finally push American voter-lemmings off the DECLINE cliff for good. Dan, a well written, thought provoking piece, thanks. I have some residual fondness for the OECD having worked for the Australian Treasury which has been heavily involved in OECD processes and has used OECD research on tax policy impacts and productivity to argue for economic reforms in Australia. The OECD Economics Department has done some good work on modelling the impacts of tax policies in the past and it would be regrettable to lose its analytical firepower. That said, I acknowledge there are many areas of the OECD that could be cut without detriment. And whoever commissioned that piece supportive of the Occupy movement has serious questions to answer.